Blog Quick Quotes: Inspiration with Dana and Kate! Inspiration with Dana and Kate! Hi Quick Quotes fans! Dana here today sharing one last layout before the New Year. I've been having a blast visiting family and friends this holiday season. I've also shared many happy times with family pets! I'm lucky to have not one, but two, bulldogs to spend time with! This sweet girl belongs to my brother. I used patterned papers from the Quick Quotes Beautiful Life, Happiness and Treasure Chest collections. I saved a fun paw print cellophane bag from my last trip to the vet clinic and added it to my layout to play up the pet theme of my page. I cut colored rectangles from a piece of Happiness 400 patterned paper and arranged them into a tree design that I decorated with small pieces of chipboard. I edged the newsprint patterned paper, which I think is just fantastic for pet pages, with Red Hot PowderPuff Chalking Ink, the perfect shade of bright red for festive holiday projects. 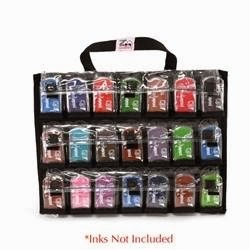 If one of your resolutions for 2014 is to get organized, why not pick up one of these Ink Organizers?! This storage organizer, by Zookeeper, was originally designed for embellishments and little pieces, but also works GREAT to store Powder Puff Chalking Inks! This organizer holds all 24 Powder Puff colors and has plenty of room for the NEW COLORS coming in January! These organizers are in very limited supply, so pick up yours before they’re gone! Happy (almost) New Year! Kate here today, sharing my last project designed for Quick Quotes. I have been truly blessed to design for such a wonderful company over the past year, so today I am sending some Quick Quotes Blessings your way! My wreath was created with Quick Quotes papers from previous Club Q Kits. I mixed and matched the papers then used my Silhoutte to cut out the leaves and banner. 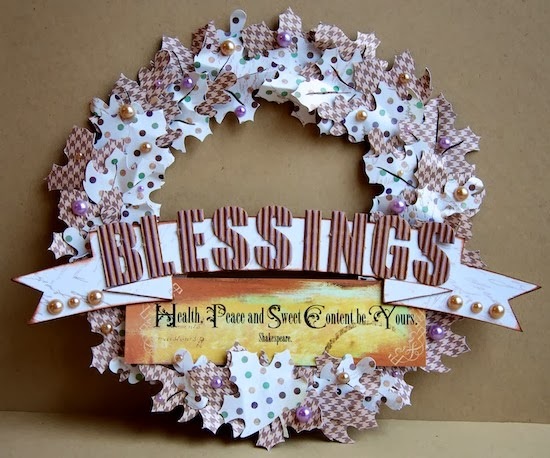 Lots of Quick Quotes Chalking Ink adorns the word "Blessings" and the outside of the banner to give them both some dimension. 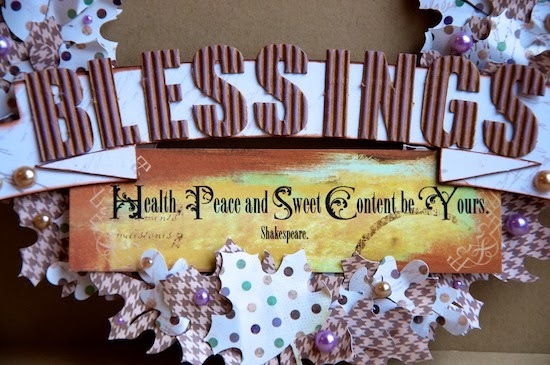 The fabulous Shakespeare quote is from Quick Quotes Sentiments Bundle. It is the perfect blessing for the new year! Wishing you all a healthy, peaceful and contented 2014! We want to take a moment to wish all of the very best to our 2013 Designers that are moving on. You've inspired us beyond measure and been so wonderful to work with! All the very best to you in 2014 and beyond!!! Fantastic LO and wreath, Dana and Katie. You two are always so inspiring! Dana that is an awesome LO. Really like how you incorporated the bag. Kate your wreath is gorgeous.